Official approval has been confirmed by the Punjab cabinet to initiate the Metro Bus project in Multan, Faisalabad, Rawalpindi and Islamabad. The meeting was headed by Chief Minister Punjab, Shahbaz Sharif. During the meeting spoke about Metro Bus project, land record computerisation system and production of power based on coal and said that all of the steps taken by Punjab Government are for the well-being of the people. Shahbaz Sharif said that metro bus project has been a success in Lahore and now the government has decided to implement the service in three other major cities of Punjab. Rawalpindi to Islamabad metro bus service will be up and running in 11 months according to Shahbaz Sharif. 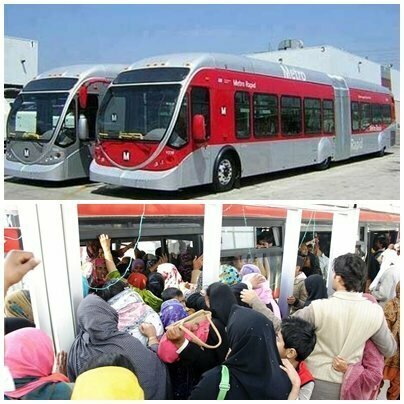 On the other hand Multan to Faisalabad metro bus service will take 10 months before it can be fully operational. Islamabad to Rawalpindi metro bus project will cost 38 billion rupees and 1.5 lakh people will be benefited from this service. Although metro bus project in Lahore has been termed as successful by Punjab Government every now and then, but when different sources are studied, the success or failure of metro bus project can be argued and debated over and over again. The project in Lahore seems to be too much expensive and the number of people it benefits is quite less. The comfort is not there as was promised and advertised as there are some pictures that show a huge number of passengers and limited number of buses and only a few people get seats. Rest travel by standing. In addition to that male and female passengers have to stand together that is really uncomfortable for female passengers. So to summarize things, Shahbaz Sharif should first concentrate to fulfil the needs of Lahore and then it would be a good option to turn sight towards rest of Punjab. Metro Bus project, land record computerisation system, production of power based on coal and technology parks in Rawalpindi/Islamabad are good initiatives by the govt.